Being a responsible shuffleboard owner means knowing how to care for your table. For many, a shuffleboard table is an investment and we believe this investment should be protected. Recently, we received an email with questions about proper shuffleboard table and care, maintenance, and cleaning instructions. This is a great topic that everyone needs to know about. 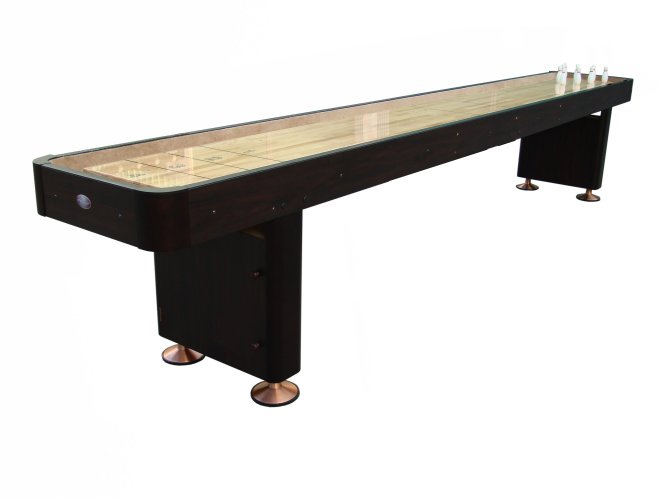 9′ Espresso Playcraft Woodbridge Shuffleboard Table. Only $1,250.00 with Fast and Free Shipping! Don’t put it by windows or locations that place it in direct sunlight. The sunlight causes a constant expansion and contraction that can potentially warp the table. The sun also dries the silicone spray that is applied to the playfield surface. This will affect play speeds. Make sure that you have enough room on all sides to play. This will ensure that you don’t damage the outer cabinet with dents and dings. Many a belt has been known to scratch the cabinet of the table when trying to squeeze by. Don’t let this be you! Outdoor shuffleboard tables should always be covered when not in use. Indoor tables should also be covered when they are placed near windows that allow in direct sunlight. You can purchase shuffleboard table covers here. How you clean your shuffleboard table depends on the type of finish that your table has. If you don’t know what type of finish you have, you can contact your manufacturer with your model number to find out. In general, a polymer coating creates a smooth glass-like finish. A lacquered finish is a clear or colored wood finish that produces a hard and durable finish. The shine of a lacquered finish can vary. It’s best to clean older wood natural wood finished tables with a good old fashioned mixture of water and vinegar (1/4 cup). For best results, you can even add a few drops of wood polish to bring out the rich tones of the wood. Polymer finishes can be cleaned with a damped rag and wiped down. It is safe to use glass cleaners or multi-purpose cleaners on the surface of polymer finished tables without having to worry about damaging the table. These cleaners are not so harsh that they will damage or deteriorate the finish. Lacquer finishes can be kept up to date with furniture wax. Don’t skimp here, make sure you buy a quality furniture grade wax that is strictly intended for wood applications. You can apply it with a lint-free cloth. This can be done once a month or as needed. You have to adjust your climatic adjusters. Sometimes you’ll notice that polymer finished tables need to be adjusted more often than traditional wood finished tables. Read this post to learn the full details on how to adjust the climatic adjuster on your shuffleboard table. Adjustments must be precise or else your table will not play right. Outdoor shuffleboard tables are often treated with UV inhibitors and constructed using all-weather materials. As with anything that is all-weather, this does not mean that your outdoor table is unbreakable. We still recommend that you care for your outdoor table just as you would for an indoor shuffleboard table. When not in use, it is important to keep the sun off of your table when not in use. The sun can damage your table and cause warping, fading, discoloration, cracking, and peeling. Shuffleboard tables are an essential accessory for outdoor tables and strongly recommended for indoor tables. Have you ever noticed how much dust your home furniture collects just sitting inside the house. Well the same holds true with your shuffleboard table. 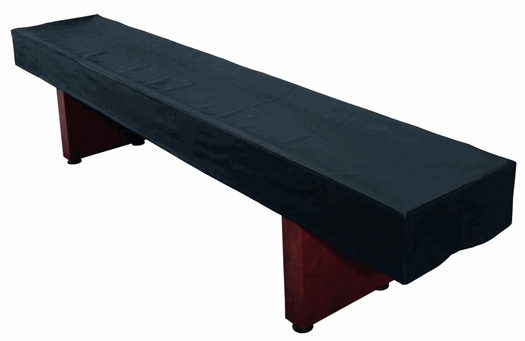 The Deluxe PU Leather Shuffleboard Cover is available for 9′-22′ tables. Starting at just $90.00 with Free Shipping. We recommend covering your shuffleboard table when not in use to prevent spills, accidents, and water marks. This is especially for tables in bars and other commercial venues; when the place gets packs, customer will place their drinks anywhere they can! Shuffleboard table covers are a must for outdoor tables or the sun will surely take years off the lifespan of your table. Purchase a Shuffleboard Table Cover. Shuffleboard Wax is an important part of your shuffleboard tool bag not only because it will improve your performance, it also keeps the surface of your table nice and smooth. If you don’t use shuffleboard wax, your weight will scratch your table and can lead to grooves over long periods of time. Wax makes sure that your puck glides on top of the sand and not directly on the table. 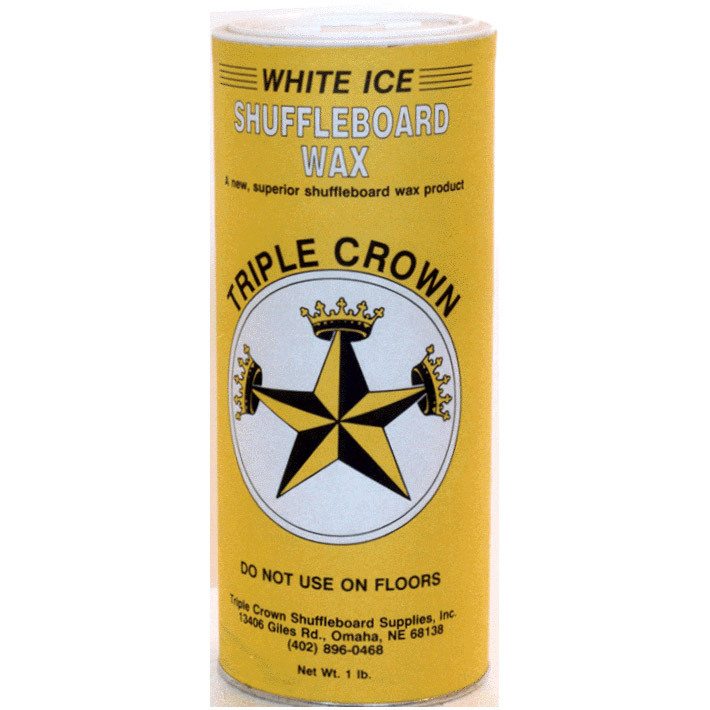 Triple Crown Shuffleboard Wax -White Ice 12 Pack. $98.00 Lowest Price Guaranteed. Purchase Triple Crown Shuffleboard Wax. Triple Crown makes a 3 part kit that includes a glaze cleaner that removes dirt and residue from your table. Second is the liquid wax which serves as a protective coating to keep you table nice and smooth and keeps that table well-cured. The third part of the kit includes a silicone spray which is used immediately before playing. This silicone spray is used along with shuffleboard wax; it does not replace the wax but it will reduce the amount of wax you need during each game. It acts much like a car wax that can be buffed off after the wax has cured and become dry. Refinishing a shuffleboard table is generally a job you want to send to the professionals. Working with fine wood requires great skill and is not an easy do-it-yourself type of activity. You’ll have to find a Professional furniture refinishing shop that specializes in applying polyurethane lacquers and polymer pouring. Below are articles with much more in depth information about how the refinishing process works. We recommend reading these resources thoroughly before attempting to refinish your table on your own or taking it to a repair shop. Visit Shuffleboard.net for the Lowest Prices and all of the latest supplies! Thanks for checking out our Shuffleboard Table Maintenance Guide. Don’t forget to stop by our website to check out some of our new toys! What is Proper Shuffleboard Maintenance?